The iPad sensor from Occipital has new iOS apps that use 3D scanning to measure rooms, ship items, and even take next-gen family portraits. Just a few years ago, 3D scanning seemed like something straight out of a science fiction novel. Today, 3D-printed fashion is already walking down the runway. 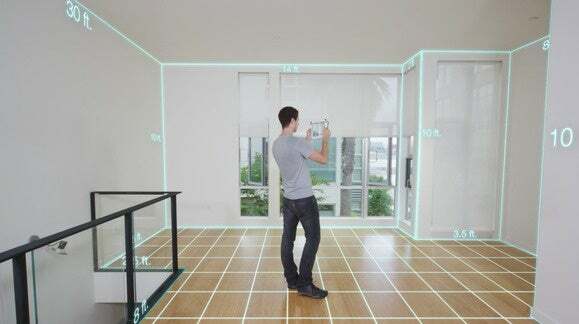 The Structure Sensor by Occipital, which claims to be the world’s first 3D sensor for mobile devices, is taking 3D scanning to the next frontier: your living room. By installing iOS apps built specifically for the Structure Sensor, you can begin to incorporate 3D scanning into your everyday life, from finding the right shipping box to measuring indoor spaces, and even capturing 360-degree body scans of your loved ones. This lightweight anodized aluminum accessory attaches to an iPad with a bracket and connects with a Lightning cable. The sensor is compatible with the current iPad models with Lightning ports (4th generation iPad, iPad Air, iPad Air 2, iPad mini 2 through 4). Once connected, the sensor expands on the iPad’s built-in camera to capture and display 3D scans. The Structure Sensor casts thousands of invisible infrared dots onto objects and spaces. Using structured light, the sensor records the distance between each dot and the camera to construct a 3D geometric pattern. The sensor has a depth sensing range of almost 12 feet, so it’s most ideal for scanning indoor rooms, objects and people. 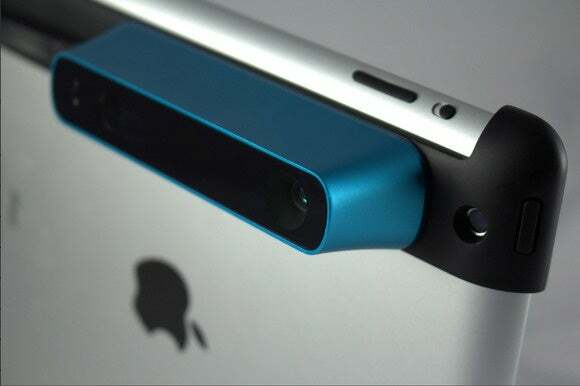 Occipital sells the Structure Sensor in two colors, silver or blue, for $379. That includes a bracket for the iPad model of your choice. To get started with the Structure Sensor, first you should download the accessory’s official iOS app that keeps track of battery life and firmware updates. The sensor has an internal battery, so it won’t drain your iPad, and this built-in battery lasts three to four hours while in active use. 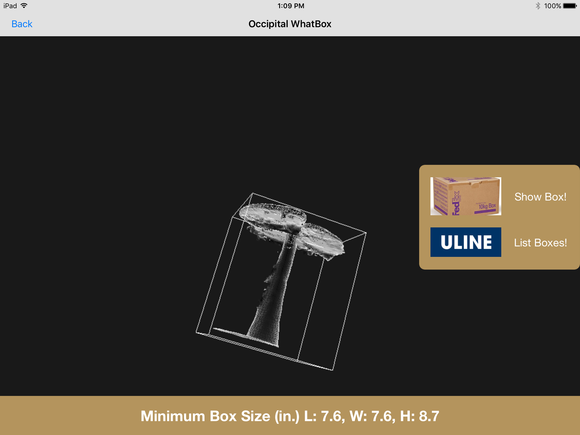 Occipital recommends also installing the free Calibrator app to make sure the color textures are accurate. Calibrating the sensor takes a few minutes thanks to the guidance of a quick tutorial, and it’s crucial if you’re using an app that relies on the iPad’s color camera. We tried out three free iOS apps that really bring out the Structure Sensor’s real-life potential. I don’t even have a ruler at my house, let alone a measuring tape. Thankfully, I do have an iPad laying around, and using the Structure Sensor allowed me to measure my living room before ordering a new sofa from Ikea.com. 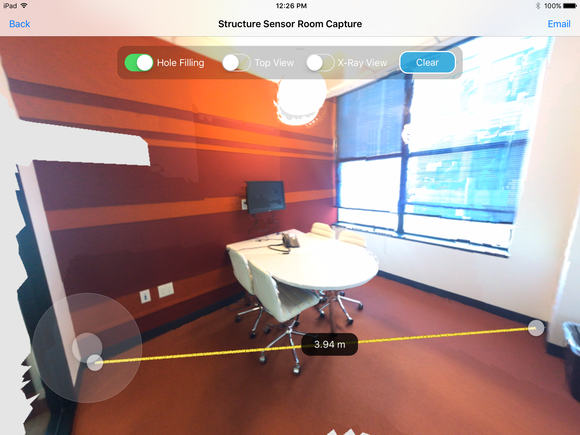 The free Room Capture app for iPad uses the Structure Sensor to map your indoor space and provide exact measurements. Once you open Room Capture, just move the iPad to map the entirety of the area you want to capture, up to the ceiling if you want. After you’re done scanning the space, you can simply tap on two points on the 3D map, let’s say from one corner to another, to get an instant measurement of the length between the two points. You can also view the space in x-ray mode or get a bird’s eye view, to help with entire room measurements. Let’s say you want to ship a stack of books, a speaker, or even a chair, but you’re not sure what size box you’re going to need. Using the forthcoming WhatBox app and the Structure Sensor, you can get scan the item and get its exact dimensions, in both centimeters or inches. WhatBox also links you to either FedEx or Uline.com to order the box online. FedEx, however, only sells five standard box sizes so having WhatBox measures items so precisely seems a little bit like overkill. For example, a Magic Mouse measures 2.4 x 3.5 x 0.8 inches, according to WhatBox, and the FedEx box it suggests for that is 12.25 x 10.9 x 1.5. Well, of course it will fit. Did I really need a 3D scanner to tell me that? Uline.com has a wider selection of box sizes, but if you click to see them after scanning your item, you get about 30 results. You have to then browse to find just the minimum-sized box that it will fit in, and Uline.com requires a minimum buy of 25 boxes. Even though WhatBox’s integrations with shipping retailers seem rather moot, having the exact box measurements of an item, especially something weirdly shaped like headphones or a stuffed animal, does come in handy. The most interesting app I tried that works with the Structure Sensor happens to be the least practical. The itSeez3D app captures a full-color 3D replica of people, either just a Roman Empire-style bust or the entire full-length body. 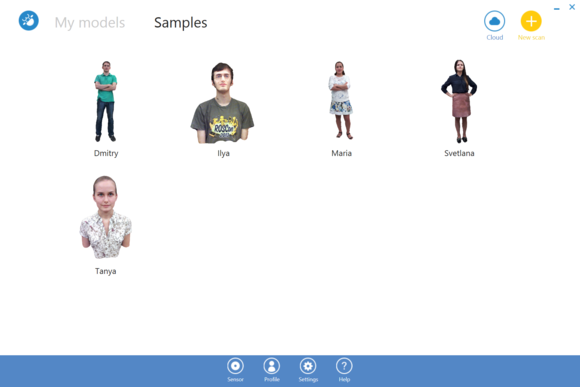 The first thing the itSeez3D app will ask is if you want to scan an object or a human. Have your human subject stand still as you walk around them scanning all sides of their body, even the top of their head and under the chin. During the scan, the app will alert you if you’ve gotten too closer or too far or if some other misalignment has happened so you can correct it on the spot. itSeez3D will then upload the body scan to the cloud, which takes about five minutes. You can email yourself the scan in a WRL file format so you can upload it to Shapeways.com, the 3D printing shop, and have them make a figurine statue out of it. That’s right, now you can have your cheesy family portrait 3D-printed and put up on a mantle. Sounds like something Kanye West and the Kardashians might want to add to their holiday wish list. The Structure Sensor is definitely at the forefront of making a 3D scanner as indispensable as a measuring tape. But just like a measuring tape, you can live without it—for now. The best part of the sensor is that it has a Structure SDK so that developers can tap into the depth data to create iOS apps that really are the firsts of their kind. The reasons for having a 3D scanner at home will only increase, making the Structure Sensor even less of a one-trick pony. Maybe soon we’ll be able to use this sensor to figure out exactly how much gift wrap we’re going to need to cover up all those holiday gifts.